If it’s peerless bays, private coves, turquoise waters, a bit of nightlife, some peace and tranquility, and plenty of history and culture, then embark on a blue cruise Turkey holiday from the colorful city of Marmaris. Take a journey filled with beautiful destinations, plenty of activities for choice and explore the ancient Carian coast all the way to the Gulf of Fethiye on a yacht charter Turkey vacation. 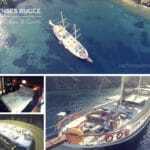 Expect sincere and professional private gulet charter services, savory cuisine from the Turkish kitchen, and destinations galore. This is a one week Turkish gulet cruise and embarkation in Marmaris harbor begins at 3:00pm – after your airport transfer from Dalaman International Airport. It is an unforgettable holidays for 8 days and 7 nights. On your first day, it’s all about settling in, meeting the crew, enjoying a welcoming cocktail, and getting to know your gulet. 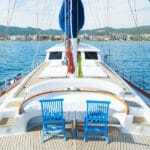 There will be an overnight stay in Marmaris harbor and you will enjoy a lovely dinner on board. After dinner, a stroll about the city’s nearby area which makes up the harbor region may be an idea to visit some shops, have a drink at one of the waterfront bars, go for a nice walk along the long promenade while enjoy the surroundings. After hours, there is plenty of nightlife entertainment on Bar Street – which is a mere few minutes walk from the boat. Marmaris is part of the Caria coast collection, and has gone through the governorship of many civilizations. The famous landmark, the Marmaris castle also seen in the harbor dates back to the 1500’s and worth a tour if it is open when you arrive. There is also the colorful Musical Fountain Square that is one of the newest features and referred to as the ‘New Centrepiece’ of Marmaris. On this day, you will enjoy your first breakfast. The Turkish breakfasts offer a wide assortment of cheese, olives, honey, jam, Turkish sausages, eggs, fresh oven bread, fresh walnuts, dried apricots, and much more. Then after breakfast, you can discuss your itinerary with the captain and crew. The cruise will start with Ekincik Gulf. In this region you will have the opportunity to join the Dalyan Tour. This tour offers the natural beauty found in Dalyan Delta. A short trip from the gulet to a riverboat called a Piyade will take you to the ancient city of Caunos where , after a brief hike, see the embedded King Rock Tombs. Dalyan was also one of the Carian cities and known to be founded by Miletos’ son. Other than the Rock Tombs, the Akropol castle, ancient amphitheature and the Basilica complex can been explored. Another known feature of Dalyan are the protected Caretta Caretta turtle in Iztuzu beach. Before seeing the beach, a stop in the Dalyan mud baths might offer quite the rejuvenation experience. Following these excursions, there will be an overnight stay in the Gulf of Ekincik where you will also enjoy a splendid dinner on board your private yacht charter. Due to the wavy capes of Disibilmez and Kuroglu, an early morning cruise will take place, taking you into the Gulf of Fethiye. Shortly after arrival, breakfast will be served nearby Tersane Islands. Tersane is a naturally protected bay and used as a harbor. In ancient times during the Byzantine and Ottoman periods, Tersane was used as a shipyard – hence the name ‘Tersane’, meaning shipyard in Turkish. Your lunch and leisure time for swimming and other water sports, you will be in Manastir Bay. This area is also known to be called Cleopatra Bay or Sunken Bath, based on the lovely underwater ruins of a bath that remained from past civilizations. The next destination for anchorage will be Kizilburun. Here you will enjoy another new sunset, tasty dinner and an overnight stay. This day will bring you into the breathtaking harbor of Fethiye, which was also known as the ancient city of Telmessos. Telmessos, famous for its prophets, was consider one of the most important cities along the western border of Lykia, along with Caria. Sources believed that the name came from Apollon’s son, Telmessos. The city of Fethiye stretches out in a semi-circle and protected by 12 islands. There are land excursions available to Oludeniz and the Saklikent gorge. Oludeniz is considered one of the most photographed beaches in Europe and certainly worth a visit by sea, if not by land. Upon reaching this area, you will notice the numerous paragliders in the air, hovering over the bay. They take flight from 1900 meters off of Mt. Babadag. Pilots are available to join you on this adrenaline pumping activity. You will stay overnight in Fethiye harbor and enjoy a lovely dinner prepared by your chef on board with an chance to stroll about the city harbor area. There are many charming cafes and bars to sit and enjoy a drink or two. This is the day of islands. Yes, here you will enjoy a hearty Turkish breakfast and will drop anchor nearby Gocek Island. After you breakfast you are free to lounge about, go swimming or do other relaxing activities. Then lunch will be served. It is certainly a beautiful and peaceful area to enjoy a quiet lunch and conversation. Then its off to the Yassica Islands which is also referred to as the 12 Islands of Gocek. You and your group will be spending the night here and taking in all the impressive scenery that will be surrounding you. More blissful bays await on this day. After your breakfast, your private gulet charter will cruise to the Bedri Rahmi Bay – one of the many picturesque bays in the region. The name Bedri Rahmi is a famous Turkish artist who was also known to have created the first blue cruises in Turkey – other than Cevat Sakir in Bodrum. 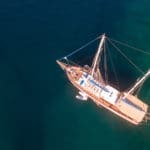 After a bit of leisure time to yourselves, your gulet will then cruise to Domuz Island for more free time and drop anchor in Aga Port for a beautiful dinner and overnight stay. On the 7th day, your gulet will begin its return towards the Marmaris region. But before reaching the harbor there will be a few more destinations to visit. During the early morning hours, the captain will cruise to Kadirga Bay. Your breakfast will be in Aga Port where you stayed the day before, and your lunch will be served in Kadirga Bay. 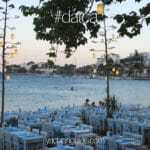 It is a peaceful bay even though it draws a lot of daily boat tour traffic from Marmaris. There are water sports available that you can hire; such as jet skiis, ringos, banana boats and the like, offered by privately operated companies. The next lovely destination on the agenda will be Turunc bay. Turunc is one of the popular holiday resorts, favored by travelers around the globe. It offers a charming town, filled with little shops, bars and restaurants. The views are quite impressive as it is practically surrounded by lush green hilltops with a cozy yet wide open bay. Later on in the day, a cruise to Cennet Island will offer you more peacefulness and you will most likely drop anchor in a private cove to enjoy more leisure time on board or in the water. The option of an overnight stay will be to stay in Cennet Island or return to Marmaris harbor. Should you decide to return to the harbor, you might like to enjoy more of Marmaris city center and its fantastic lively nightlife entertainment. Overnight stay will be in Marmaris Harbour. Guests wishing to see more of Marmaris are recommended to go to the city center and experience the lively night life. This is the day when you will enjoy your last breakfast on board your gulet, pack up and then say your good-byes to the captain and crew. Depending on the time of your return flight from Dalaman Airport, you can keep your belongings in the office of your agent while seeing more of Marmaris. Alternatively if you need to catch your flight right away, your transfer will be waiting to take you to Dalaman. Please note that this itinerary is intended for private yacht charters. Not shared cabin charter cruises.